Check Transient in the Select analysis section on the right side of the dialog box. Click the Transient tab, and then enter the values which are shown and explained below. Stop time The finish time of a transient analysis. Start saving data at t = SIMPLIS starts saving plot data at this time. Number of Plot Points The total number of points to be generated. These points will be evenly spaced between the start and stop times. SIMPLIS automatically adds plot points whenever a PWL topology changes or a logic device changes state. For more information, see the Advanced SIMPLIS Training topic: 2.0.1 Transient Analysis Settings. The Advanced... button on the Transient tab of the Choose Analysis Dialog brings up the following dialog, allowing you to enable snapshot output and to specify an average topology duration. SIMPLIS allows you to save its internal state in order to repeat a run where it had previously stopped. The internal saved states are known as snapshots. 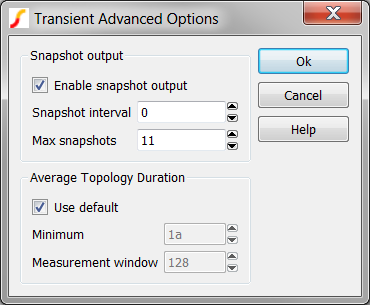 On the Transient Advanced Options dialog box, you can define the number of snapshots SIMPLIS creates and stores. SIMPLIS always saves a snapshot at the beginning and end of each run. If you start a new run of the same circuit with the Start saving data at t = parameter equal to the stop time of the previous run, SIMPLIS does not need to rerun the simulation from time=0. 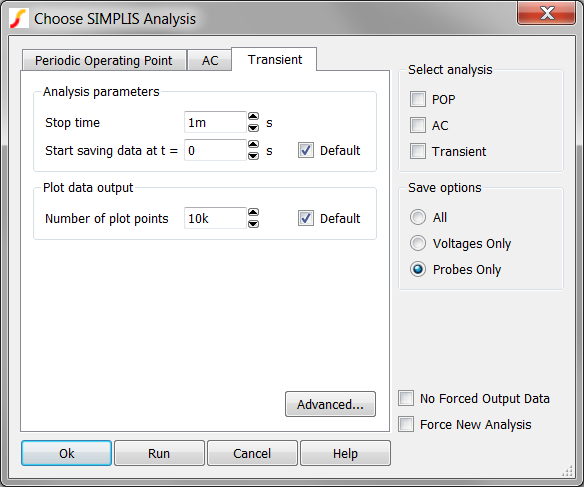 If Force New Analysis is unchecked at the bottom right side of the Choose Analysis Dialog, SIMPLIS automatically loads the snapshot taken at the final time point of the previous simulation. If Force New Analysis is checked, SIMPLIS simulates from time=0 but ignores all data taken from previous simulations. Valid snapshots will not be loaded and SIMPLIS will simulate the circuit as if the circuit has never been simulated before. The top section of Transient Advanced Options dialog allow you to specify the saving of snapshots at other times as well as the end of a run. This is useful if you want to restart a run at some before the end of the previous run. Enable snapshot output Check this box to enable saving of snapshot data. Snapshots are always saved at the beginning and end of a run. Max snapshots Maximum number of snapshots that will be saved. This setting overrides Snapshot interval if there is a conflict. For more information how to apply snapshots, see the Advanced SIMPLIS Training: 2.0.1 Transient Analysis Settings. SIMPLIS calculates the average time it spends in each topology over a defined number of topologies. If this value falls below a minimum value the simulation aborts. The entries in the Average Topology Duration group define the parameters listed below. Minimum If the average time falls below this threshold, the simulation will abort. Measurement window The number of topologies over which the topology duration is averaged. This uses a moving window averaging system. The purpose of this is to resolve problems with the simulation getting ‘stuck’ in situations with unexpected high-speed oscillations. If this happens you may wish to increase the minimum time or reduce the measurement window as appropriate. For more information about how to debug circuits which are run slowly or appear to be stuck at a simulation time, see the Advanced SIMPLIS Training: 4.5 Debugging Slow Simulations.